Built just over two years ago this contemporary townhouse has everything you need for comfortable family life. Bold use of colour and design by the current owner showcases the property at its very best. There is wonderful space inside set over three floors. 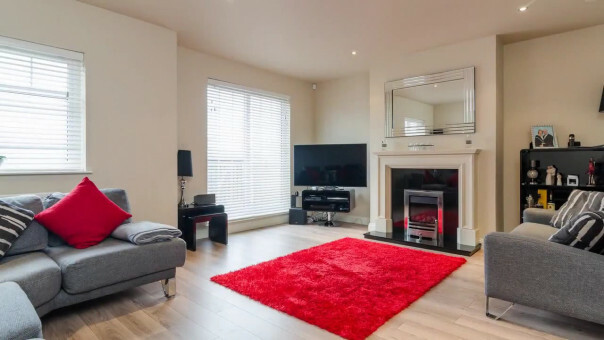 The property has three double bedrooms on the top floor and the potential for a fourth on the ground floor which is currently being used as a games room. The living accommodation on the first floor flows from the lounge into the dining room and modern fully fitted kitchen which is ideal for today’s lifestyle. The location puts you right in the heart of leafy south Belfast within walking distance of Stranmillis and the Ormeau Road and close to the Lagan tow path and Belfast Boat Club. A floor to ceiling picture window makes a great feature in the entrance hall. You can access the garage from here and a ground floor shower room. There is also a large store room off the hallway. The utility room is well fitted out with a range of cupboards and a single drainer stainless steel sink with room for a washing machine. Striking feature black and white chequered tiles make a real impact in the hallway and are carried on through into the living room. Here bold use of bright colour and minimalist styling has created an ultra modern look which is in keeping with the design of this contemporary home. French doors open onto the garden. While the living room is bright and bold, the kitchen is decorated in calm, neutral tones which perfectly showcase the modern light grey units which are topped with granite work surfaces. There is a gas hob and electric oven plus an integrated fridge/freezer and dishwasher. The kitchen opens into a lovely dining area which has double French doors leading onto a patio in the back garden. A spacious and elegant lounge is finished with a laminate wooden floor and has sliding patio doors leading to a private tiled balcony. This room has a beautiful fireplace with polished granite surround and wooden mantel with a gas fire. The three bedrooms are all a good size and tastefully decorated. The master is fitted with built in robes and comes with a modern en suite with double shower cubicle with rain shower. The family bathroom is bright with a white suite which includes a panel bath with telephone shower attachment and contemporary tiling on the floor and walls. Outside there is a paved driveway at the front and good sized back garden laid in lawn with a patio area.